This was a day late. I hope it won't be a slippery slope. 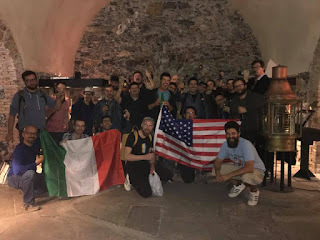 The two big talks of the towns has been the Italian Fishliver Oil Cup and the US EC Eternal Weekend tournament. The fourth annual Eternal Weekend grew almost 50% since last time, and this year Jason Jaco and friends gathered a whopping 118 players, making it the largest old school Magic gathering to date. The Italian Fishliver Oil cup tournament hosted 86 players battling for the Fishliver Oil (casually making it the third largest tournament in the world yet), and also organized the first European tournament using Eternal Central rules the day before the main event. One thing shines through all the reports from the events, regardless of continent: we are having good times with good people. This is our format, and this is Magic as we want it to be.